This guide is intended to illustrate how a properly formatted online content should be designed for both humans and bots to perform well in search results. It's intended for an online reputation management project, but the advice works for all written content. As content creators, we create articles to get read. In our humble opinion, most "guest posting" companies create what is essentially garbage. In order for an article to be read, people need to find it in search results. Once they find it, it needs to be relevant enough and of high enough quality that the person wants to read it, and share it. They need to click the headline or all is lost. The only way that will happen is with a compelling headline that makes people want to click. If your company name is "Acme Widgets Incorporated" and you want your press release, guest post, article, or whatever to rank well for that search term, make sure the term is in the biggest headline on the page. That is usually the <H1> tag. If you performa search for any brand, and look at the search results, you will see this is true. The Title of an article is bait for people and search engines. If you can find a way to add the brand name in the title and heading to a trending topic - you've found the sweet spot. Imagine being a fish in a pond with hundreds of lures in the water all trying to get you to take a bite. You are presented with a huge array of choices, but you have a limited capacity for food, so you want to pick the best. Headlines are the bait, and consumers are the fish. The nutritional value of the bait (web content) isn’t yet relevant. What is relevant is how compelling the bait is. The bait is the headline. Unless you can get users to bite the content is useless because it is not being consumed. During the content phase of web development we have found the best way to get an article to show up in search results initially is to make the article about a current topic that is in the news and trending. For example, given a choice of article topics about a fashion designer named ‘John Smith’, which one do you think would get more readers? The second one - Leonardo DiCaprio. While no one knows who John Smith is, everyone knows Leonardo DiCaprio. 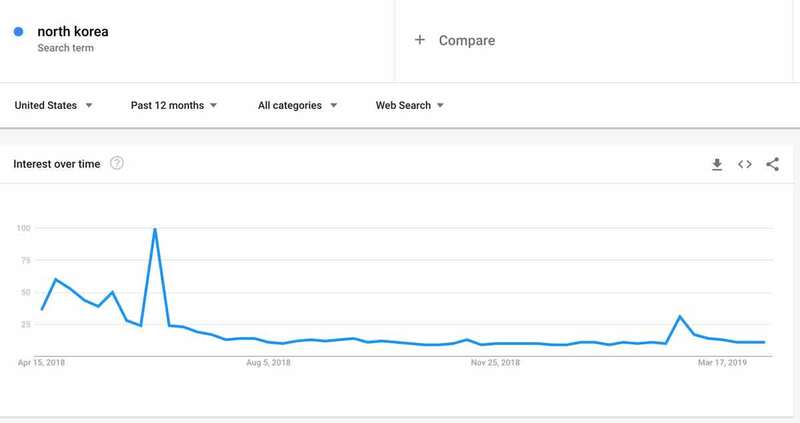 Because the words ‘Leonardo DiCaprio’ are in both the Title and the body of the article, search engines will, to some extent, show the article in searches for a hot, trending search query ‘Leonardo DiCaprio’. Which trending topics should I use? Any relevant trending key phrase that works will do. "Works" means it's relevant to the web copy. Remember, the key is ‘relevance’. Just sticking Leonardo DiCaprio’s name in there doesn’t do it because when people do click on the article, and they see that is really has nothing at all to do with the actor they will quickly click away. When users see content that is not in line with their expectations, they leave. So now you’ve created an article that gets people to click on it because of the intriguing Title you created. They arrive at the article and because you’ve done an artful job at making the content relevant to the title and interesting. Will they will read on? This can be tough, because good SEO copywriting is both art and science. Most writers learn the art of writing and the technical aspects of good English (or whatever language). Normally, writers don’t learn how to write for search engines. On the other side of the equation there are writers who are not really writers at all (in fact, some are literally machines using something called "spintax"). They write solely for search engines hoping to ‘game’ the system. Aim to fly the middle path with a preference for the people side of the equation. You’ll want the articles to be relevant to people, and to search engines, so add specific key phrases to your articles. This next section discusses how to write for search engines as well as people. Search engines look for key phrases (among other things). But they don't look as hard as they used to. Keyword "stuffing" is no longer a tactic to perform well in search results. The first place they look is in the Title of an article or web page. That is why the Title is so important. To a search engine, the Title encapsulates what the article is all about. Another reason the Title is so important is that it is often used in the URL of a web page. For example: abc.com/article/john-smith-says-leonardo-dicaprio-was-his-inspiration. After the Title, search engines look in the body (text) of the article. So variations of the key phrase need to be in there so it will be seen as relevant. In our example above, the key phrase is ‘John Smith’, but we ‘co-branded’ that key phrase with a trending key phrase ‘Leonardo DiCaprio’ to get more eyeballs and search engine love. We need to use both key phrases in the body of the article. How often and in what ratio is up to the writer, the article needs to make sense after all. It needs to fulfill the needs of the person who consumes it. What percentage of the copy should be keywords? A good rule of thumb is 2% of the words in the article should be the key phrase, and 1% should be the trending key phrase. Is this a hard and fast rule? No. One last note on quality - if the article has been written well-enough, it will be shared. This is icing on the cake. You cannot “make” something go viral. But a compelling article that will provide social credit for the sharer will be viral far faster than something that isn’t going to provide social credit. What is social credit? People want to be liked, be cool, be hip… whatever. If sharing your article or other content will make them seem cool or hip or helpful to their peers, they’ll have a greater incentive to share it. 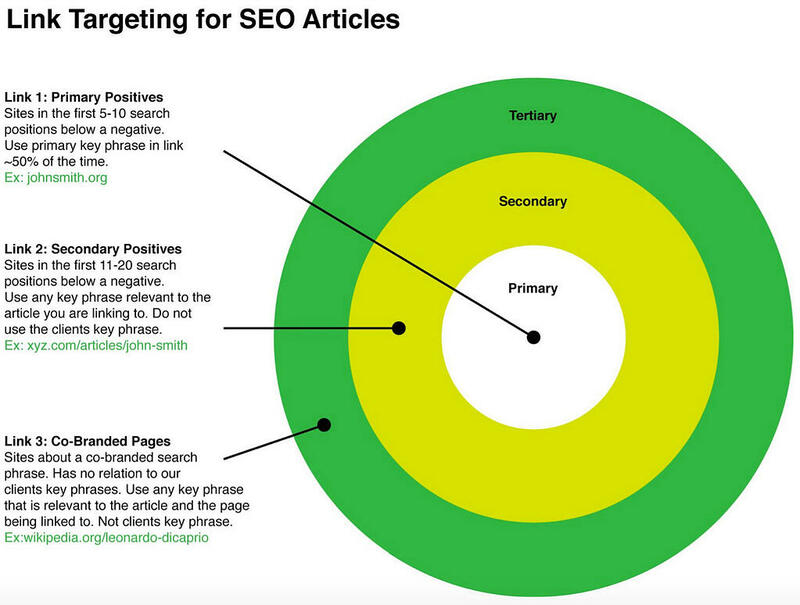 Much of the time content creators make articles so they can embed hyperlinks in them for SEO purposes. This is an example of a hyperlink. The first link is the most important link and should be in the first paragraph, "above the fold" where people scroll. It should utilize the anchor text of the client or a variation thereof. In this example it would be ‘John Smith’ - our pretend client. The link should point to the URL of an important page we want to promote. For a reputation management project to push down negative information this is often one of the five websites that are both ‘positive’ and lie below the negative. The second link should be to another page that has the clients key phrase on the page, but the anchor text does not need to be the clients key phrase, just a phrase that corresponds to both the spirit of the article and the page it is linking to. This webpage is often found on the second or third page of search results. For example, if you were to Google ‘John Smith’ you would get a large number of results. We consider this a ‘secondary’ link. It is not as important as the first link, but is still important. The third link should go to a page with the co-branded key phrase. In this case ‘Leonardo DiCaprio’. You might link to a page like this: https://en.wikipedia.org/wiki/Leonardo_dicaprio . Here is a tutorial on Meta Description tags: http://www.seomoz.org/learn-seo/meta-description. There are no links in the Meta Description, but the key phrase and co-branding key phrase are always included. This is a (short) example of how an article discussing the above conventions might look. John Smith cites Leonardo DiCaprio’s outfits in the movie ‘The Great Gatsby’ for his new line of suits. According to author F. Scott Fitzgerald “the buildings were higher, the morals were looser and the liquor was cheaper” and that is just the inspiration designer John Smith needed for his reinterpretation of 20’s fashion. According to Wikipedia, the 1920s was the decade in which fashion entered the modern era. It was the decade in which women first abandoned the more restricting fashions of past years and began to wear more comfortable clothes. Fashion design was decidedly modern. Menswear began to have that certain flair, hats were in fashion. Top hats were all the rage for the upper class, a trend John Smith wisely ignored. John Smith says Leonardo DiCaprio’s clothes in The Great Gatsby were the inspiration for his new line of reinterpreted 20’s style menswear. Note the following: The Title has both the clients key phrase ‘John Smith’ in it as well as a trending key phrase ‘Leonardo DiCaprio’. The content of the article is actually about both the designer and the actor. There are three links - the first is the ‘money’ link, the most important one. It links to the imaginary clients site. We want Google and Bing to see that link as the most important and give it some power because we want that website to move up in search results. It's basic SEO. The second link is to another site that we imagine comes up on the second or third page of search results and contains our clients key phrase. Lets pretend it is about our client (in the example it is not). Note that the second link has anchor text of ‘Fashion design’. The third link has the anchor text of the actors name, and links to a Wikipedia page. It has absolutely nothing to do with our client or the key phrase, but it is helpful to the reader. When performing an ORM project content is very important. It has to be real. Don't spin it or write crap. When someone bounces (leaves) because of bad content or something didn't meet their expectations, Google grades the content badly. So give people and search engines what they want. Included relevant links to not only your target content to which you're building a link, but also consider trending topics that make sense. Mix them together in a way that makes sense - don't force it. Hopefully, every little bit of content you create will make the internet better. Keep that in mind.